Having a garage sale is not hard to do. All it takes is some time, a few organizational skills, a tad of marketing and you will be on your way to turning your junk into cash. Use the following tips, including yard sale pricing guidelines, to maximize the success of your sale. Ask friends and family if they would like to participate in a group garage sale. You will increase your chances of attracting buyers by having a wide selection and inventory. Everyone can split the advertising cost and the legwork of advertising the sale, plus it is more fun rather than trying to do it all by yourself. Not many people want to buy dirty things. You will want to clean and fix the items you place in your sale. Load the dishwasher with all the glassware you plan to sell and you will be amazed at how much more appealing it becomes when it sparkles. If something is in need of a minor repair, go ahead and repair it. For leather items like handbags and shoes, buff them with leather cleaner. Run your clothing through the wash then neatly hand press or briefly iron over the items to make it all look crisp and appealing. Dust furniture, vacuum upholstery, clean spots, clean and freshen drawers. Furniture oil goes a long way in improving the appearance of not just furniture, but also stainless steel and plastic. Invest in a bottle. It may sound like a big job, but it is worth it. In fact, it's not unusual that once something is cleaned and fixed, many people will decide to keep it. Do your research. Check websites like Craigslist and eBay to get an idea of how to price collectibles and antiques. Also, give yourself room to negotiate and know beforehand how low you are willing to go. Remember, if time allows, you have other options for selling these types of goods. For the items that you do not sell, consider selling them on Craigslist or at resale shops. Also, there may be resale stores in your area that focus on antiques and collectibles. Check the phone book and ask around. If the item is an heirloom, check the Internet for a reputable auction house that deals exclusively in heirloom merchandise. Depending on the item, some will pay for the price to ship the merchandise. Consider the type of people that will likely be attending your garage sale. Visit a few sales in your area before you start pricing and see what people are buying and the average prices on items that are similar to what you will be selling. Take the time to clearly mark every item that you will be putting into your sale. People will not want to wait or hunt you down while they are considering purchasing an item. Pricing each item is very important. Use tie tags with strings for larger items and sticky tags for smaller items like glassware, but be very careful that the sticker does not hurt the value of the item. For similar items, such as paperback books, it is acceptable to put up a sign with one price-point. Example - All Paperback Books - 50 cents each! Avoid table pricing (example - All Items $1 on Table). This can lead to losses because there will always be some people that will say that they got their items off the $1 table. Use quarter-dollar pricing increments to simplify calculating the payment process. Give yourself room to negotiate, especially on the larger ticket items. Generally, figure around one-fifth of the retail price for items that are working and in good shape. For items only used once or twice, or those that were never used, you could get one-third of the retail value, depending on the item. If it is an off color or dated style, stick with trying just to get one-fifth of the price. If time is an issue (you are moving, you sold your house) and you are on the fence about a price, choose the lower price rather than higher price. A BOGO stands for "Buy One Get One" and it is used in retail stores to entice customers to purchase multiple items. It works the same in garage sales. Books, videos, baby clothing and records are good items to include in this type of pricing structure and people love getting something for free. The saying, "Build it - they will come," does not work when it comes to garage sales. Do not expect people to just find you. Real bargain hunters start checking the classified section of the newspaper, on Craigslist or Facebook early to plan their route. Most newspapers post weekend garage sale advertising at a lower cost than the normal classified fees. You will want to make sure you are included in this section of the paper the day before and the morning of your sale. You will probably be charged per word, so it is a good idea to think up what you want to say before calling the paper. Also, Craigslist has become a popular place for people to advertise their garage sales because it is free. Date and time of your sale. If it is a multi-family or group sale. If you live in rural area, offer directions, a landmark that your home is near, or the color of your house. A brief rundown of specific items you will be selling such as baby clothing, toys, arts and craft supplies, artwork, furniture, tools. Include the name-brand items that are in big demand, like, BabyGap (size 2t - 4t), or Ethan Allen furniture. When putting out your street signs, select the high-traffic areas of your neighborhood and around the streets that will guide the people to you. Also, flimsy construction paper is not very effective for street signs, especially on rainy or windy days. A good piece of thick cardboard cut from a box, spray painted in a unique color, with your address, and sale hours printed large enough to read, will bring the people to your door. Remember, by sticking to a specific color for the cardboard will help people spot the signs if you need to put up multiple signs directing people to your house. 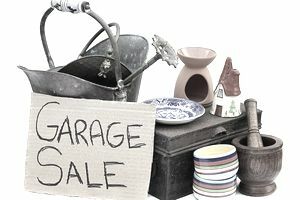 Garage-sale hunters like to feel like there is a lot of nice items for them to choose from, so take the time to think about how and where you will place things. Avoid putting items in boxes on the ground. Not too many people will bend over or kneel down to dig through it. Hang clothing like dresses, suits, skirts, blazers, coats and jackets. Designate a table for folded clothing. Include sweaters, t-shirts, jeans, and select baby clothing. Sheets, draperies, blankets, and bedspreads should be neatly folded. Use a pretty ribbon to tie grouped items together and price as a set. Place your most appealing items within eyeshot of the street so people driving by can see them. If you have sets of dishes, display all of the dishes in each set. Avoid putting one plate with a note telling the visitor that there are more. Seeing is believing, and they will want to inspect each piece. Tools, lawn equipment, workout benches, etc., will appeal to both men and women, so place them in a high-visible area. Group your items - toys with toys, clothes with clothes. Think about the setup of your nearest Wal-mart and section things similarly. Have calculators, pens, newspaper to wrap breakables, boxes, and bags handy. Have plenty of change and one dollar bills on hand. Set up a secure area for your sales transactions to enable you to keep a close eye on your money box. Inform your direct neighbors that you are having a garage sale. Offer to rope their yard to avoid people parking on their lawn. Have extension cords plugged into outlets so that electrical items can be tested. Plan to set an inviting mood by playing soft, easy-listening music. If you are short on help, consider wearing a 3-pocket apron or a fanny-wrapper purse, so that you can keep your money near you while you mingle with your shoppers. Avoid letting early-birds in before the actual time that your sale starts. It is considered discourteous to those who respect your advertised time. Plus, they tend to scoop up all the good stuff and haggle you while you are still in your pajamas or trying to down your first cup of coffee. If people ask to use your restroom, be prepared to politely tell them no. No one should go inside your home or to an area of your house that is not opened to the public. If you start to get a lot of cash, locking it in your car is an option if you can not leave the crowds to go into your house. With that in mind, keep a set of your car keys on you or in the money box. If items are not selling or it is a two-day sale and it is the second day, you may want to consider running and area that is all 50 percent off the price that is marked. This does not have to include all of the items that you are selling but do segregate the items that are no included. You may also want to place a red slash on the tickets to indicate which items are 50 percent off. Remove all of your signs as soon as the sale has ended. Your neighbors will appreciate it and latecomers will not be endlessly ringing your door bell. Lastly, grab a hot cup of coffee, go sit in your favorite chair, and count all the money that you just made from your hard work.